From July 17 to 20 at the Taipei Campus of Aletheia University, the quadrennial “2013 Taiwan Youth Convention” with its main thread as “Youth Flood Out” was held and sponsored by PCT Youth Committee. Over 270 youth from overseas or local churches took part in this convention. The main purpose of this convention is to encourage Taiwan youth to delve deep into their faith, build up an identity toward self, church and land, in order to witness the Christ and become the sign of hope in this age. During the convention, many respectable speakers were invited to share their visions, reflect Taiwan’s current social issues, strengthen the youth’s commitment toward the island and urge the youth to join the mission of God. Together with further subgroup discussion on different issues, musical praise & worship and practical visit to church institutions, the youth convention wishes the youth to inspect their faith in depth, and inquire further into the problems between church and society. Rev. 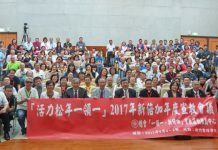 Cheng Jun-pin, Secretary of PCT Youth Committee, stressed that PCT is committed to the mission action of all peoples and tribes within Taiwan society. So, 2013 Taiwan Youth Convention wished to present the milieu and contexts of Taiwan’s multi-language and multi-culture, by blending distinctive lyrical musics from different peoples in our liturgical worship. This is to reflect the multiplicity of our concerning issues in order to open new missionary perspective for the youth. Rev. Lyim Hong-tiong, General Secretary of PCT GAO, delivered the keynote speech to Convention at the night of July 17, with the same subject as the major thread of this Convention: “Youth Flood Out”. From a historical perspective, Rev. Lyim reviewed each major youth Christian movement occurred overseas or in Taiwan. He pointed out, though, the strength of the youth might be small as a mustard seed, their impact would never be overlooked. For example, in 1795, through the fervent prayers of six young men in New England States of North-Eastern America, boosting a great awakening among the Christian youth. It gave rise to an ecumenical missionary enthusiasm within 19 century, affecting many extraordinary missionaries like James Laidlaw Maxwell, George Leslie MacKay, Hugh Ritchie, Thomas Barclay, William Campbell and James Ira Dickson to deliver good news and become Taiwan’s blessings. In 1985, the Student Christian Movement also manifest the great power to affect the secular world. On July 1948, there were 1,243 PCT youth assembled in this same Tamsui Town, holding the first Taiwan Youth Convention ever. They asked to “unify the southern and northern Presbyterian churches” and “establish a general assembly”. 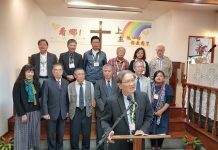 When Taiwan Youth Fellowship, generally called TKC, was set up in May 1949, the timing to unify the southern and northern Presbyterian churches is very close. Therefore, the youth were seen actively took part in the establishment of general assembly in 1951, the double increase mission movement from 1955 to 1965, and even the social and political events in 1970. “Once the youth are ready to pursue the realization of God’s sovereignty, God will bring down His power to fulfill His will on earth for sure”, emphasized Rev. Lyim, as the mission of PCT has grown to cover all social dimension of Taiwan. From 2010, based on the idea of an integral mission, PCT GAO started to propose “One Leads One New Double Mission Movement”. Lyim sincerely invited the youth to participate this “One Leads One ” movement, expecting the action of our “Youth Flood Out” to listen the suffering of Taiwan people with the Christian action as sign of hope. This means an identification with Taiwan, devotion to faith and continual growth in body, mind and spirit! TKC Youth worship and praise God in a context of multi-culture and different music milieu.